BASKETBALL SPOTLIGHT NEWS: Basketball Spotlight Atlantic City Showcase 8th Grade Blue Division Championship Recap: Milbank Cashes In! 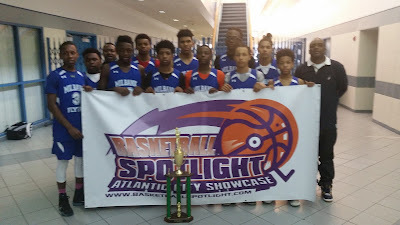 Basketball Spotlight Atlantic City Showcase 8th Grade Blue Division Championship Recap: Milbank Cashes In! Milbank Flyers used a up and down style to defeat Team Philly 60-33 to win the Basketball Spotlight Atlantic City Showcase 8th Grade Blue Division Championship. We would like to congratulate both teams for making it to the championship and we look forward to seeing them in the Memorial Day Classic.